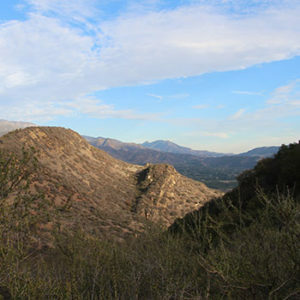 On Saturday March 18 the Ojai Valley Land Conservancy (OVLC) will host a nature hike on the Valley View Preserve. Perry Van Houten, OVLC Docent and hiking columnist for the Ojai Valley News, will lead the hike. This is a great opportunity to walk several of the OVLC’s beautiful trails in the front country above Shelf Road. Hikers will meet at the Pratt Trailhead, then walk along Shelf Road to the Fox Canyon Trailhead. Hikers will go up Fox Canyon Trail to Fuelbreak Road Trail then back down on Luci’s Trail. Total distance is about 3 miles, with an elevation gain of about 750 feet in less than a mile. The elevation gain makes this a moderate-to-strenuous hike. The beautiful vistas of the valley make the strain worthwhile. Wear sturdy shoes and bring sun protection, a small snack and plenty of water. A hiking stick would also be useful. To reach the Pratt Trailhead, drive up N. Signal St to a left-turn at the signed turnoff for the Pratt Trailhead (if you reach the top of Signal St you have gone past the turnoff). Drive a short distance on this dirt road to the trailhead at its end. This is a free event for the public. Each year the OVLC hosts thousands of nature enthusiasts including hikers, equestrians, school children and community groups on its preserves. Whether a visitor, newcomer or longtime resident this is a great opportunity to get out and enjoy the day with other nature lovers. Reservations are not required but are appreciated. For more information or to sign up contact Marti Reid at (805) 649-6852 ext 2 or marti@ovlc.org.